One of the most frustrating things that can happen when you install a new mixed shrub border, garden, front foundation planting or annual display is waking up to find that some of your new plants have been eaten! Very often, the culprits are whitetail deer. We've developed so much of the open land and woodlands that their habitat inevitably overlaps with ours. Yet there's still enough open space for them to find shelter, allowing them to reproduce freely. What do deer eat in their "natural" habitat? In most areas, deer eat just about any type of vegetation or mast they can find. They can be picky eaters; if it doesn't taste quite right, a doe will spit it out. Fawns learn which plants, nuts and fruits to eat from their mothers. A deer's sense of smell tells it whether a plant is good to eat. That's why many strongly scented plants, such as most herbs, are not favored by deer. That's also why strong scents are used as deer repellants. Deer forage consists of forbs and mast. Forbs are herbaceous flowering plants that are not graminoids (grasses, sedges and rushes). Examples of forbs include clover (which is growing in your lawn), sunflowers (which you're trying to grow for fun) and azaleas (which you were hoping would add curb appeal this spring). The term "mast" was probably first used to describe a food source for domestic livestock. Its definition is: "the fruit of oak or beech or other forest trees used as food for hogs and other animals.” In wildlife biology, mast refers to the fruits of woody plants. All trees and shrubs produce some type of fruit. Mast is often characterized as either "hard" or "soft". Hard mast consists of hard shelled seeds that have a relatively long shelf life and are high in fat, carbohydrate and protein - it's high in energy content, and is a key food source for survival during the winter. Examples of hard mast include acorns, hazelnuts, hickory nuts, beechnuts and walnuts. Soft mast is fleshy perishable fruit that is high in sugar, vitamins and carbohydrates. Soft mast can be an important source of moisture for wildlife in times of drought, as well as a crucial energy source for some species during migration. Examples of soft mast include cherries, crabapples, apples, persimmons, pawpaws and blackberries. "The most serious impacts of deer on Westchester County’s flora, fauna, and ecosystems result from browsing of plants for food. 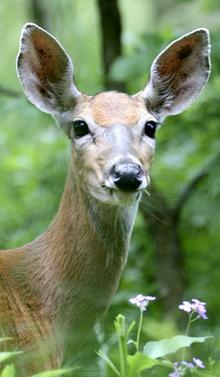 Deer consume an average of 4 to 8 pounds of forage per day; one deer can eat one ton of vegetation annually." In winter, deer are often forced to feed on twigs and other woody browse, which are low in nutrients. So if they come upon some really tasty evergreen leaves or buds, they chomp away. In early spring, when buds start to swell and leaves start to sprout, plants are particularly vulnerable because the deer may be pretty hungry by then. The Final Report of the Citizen's Task Force on White-Tailed Deer and Forest Regeneration was issued October 28, 2008, and is available online. The report explains the history of the problem, cites statistics about deer density in the county and reviews the various methods that could potentially be used to address the deer overpopulation. There's also analysis of the pros and cons of each idea.